Basic storyline: Set primarily in 1979, Kassia, a widowed mother with a strong commitment to her faith, struggles with her son’s rejection of the church. Her son, Johnny, who was born with a large birthmark on his face, struggles with the acceptance of his place in the world as well as the questions of character of his father. Tension rises with the return of Kassia’s two sisters (who are nuns), the arrival of Johnny’s childhood pen-pal crush and the Pope’s first visit to Chicago. What stood out: The themes in this play are extremely prevalent, tackling the ideas of God’s love versus God’s wrath. 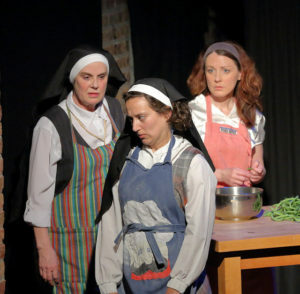 Playwright Leigh Johnson points out the importance of community, family and at least some sort of faith (whether it’s faith in religion or faith in a cause) by constructing strong, flushed-out characters, each with their own unique point of view. 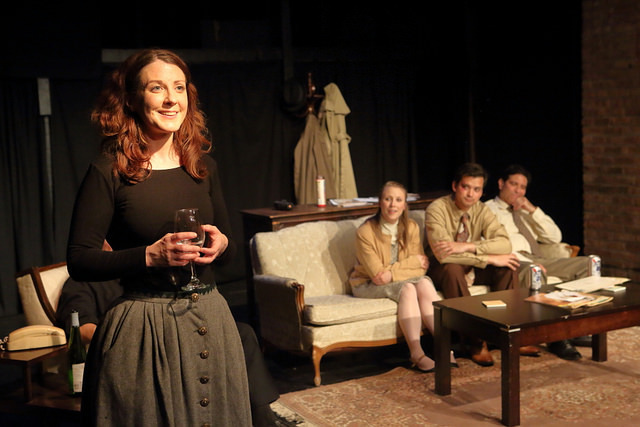 The play relies on a strong ensemble cast that complements each other well. However, Laura Brennan and Kate Robinson dominate the focus of each scene they are in by delivering stand-out performances, living in the moment and making strong, deliberate choices that drive their characters’ actions. Final thoughts: Subtext Theater is an aspiring storefront theater company that continues to put out stimulating work. A Prayer for the Sandinistas is no exception, as it continues to bring to light Subtext’s yearning for heartfelt, thought-provoking plays.